Enjoy a sumptuous dinner prepared by Anihan graduates who are now chefs at The Palms Country Club under the mentorship of The Palms General Manager and Executive Chef, Mr. Hans Neukom. Come to Anihan's Dinner for a Cause 2 and enjoy the special dinner and receive your own copy of 3 Decades of Bountiful Harvest, Anihan’s 30th Anniversary coffee table book, for a donation of Php3,500.00 only. Your donation will help us build the Anihan extension building so we can continue providing scholarship grants to less privileged young women from CALABARZON. 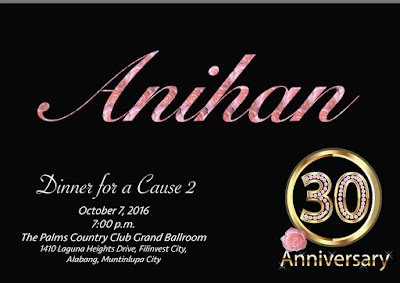 Anihan's Dinner for a Cause 2 will be held at The Palms Country Club Grand Ballroom on October 7, 2016 at 7:00 p.m.